Imagine a smart toothbrush that could tell you what part of your mouth requires extra brushing or could contact your dentist to schedule an appointment. If Ann Arbor-based Click Care succeeds with its recently launched IndieGoGo campaign, that will soon be a reality. 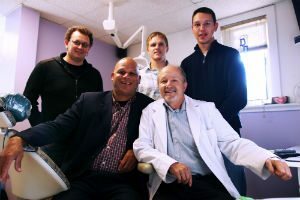 The company was created last year after co-founder Stacy Hawkins had a conversation with his dentist, William Richter. As Hawkins was getting out of the chair at the end of an appointment one day, Richter said he had an idea for an app that would give working moms better control and flexibility when it came to scheduling appointments for their children. Richter noticed many of the moms in his practice were either missing appointments or reluctant to take time off in the first place, and he wanted to make it as easy as possible for them. It can also help form good lifelong practices. After all, kids form their brushing habits early on, and the last thing they want is their parents hovering over them while they’re in the bathroom, Hawkins said. Instead, the LifeBrush can tell them if they’re doing it right. The LifeBrush will also come equipped with a thermometer to detect spikes in temperature, which is often an indication of infection or health problems that go beyond the mouth. “It gives you a chance to respond early,” Hawkins said. Click Care is currently raising $65,000 on IndieGoGo to polish up its prototype LifeBrush, with a deadline of April 13. The Mid-Michigan Innovation Center, Steinbrink Engineering, and the University of Michigan Pediatric Device Consortium are helping the company refine its designs, and one of Richter’s patients, Kyle Rokita, joined as a co-founder and builder of the LifeBrush app. Co-founder Lauro Ojeda, a University of Michigan research scientist, got involved to develop the complicated algorithms for tracking the brush location inside the mouth. So far, Click Care has bootstrapped the operation, though Hawkins hopes the IndieGoGo campaign will help build traction. After that, Hawkins said Click Care will pursue angel investment. “We want to show this is the future and we’re able to deliver,” he said. Click Care plans to sell the LifeBrush for $150-$199. Hawkins said the LifeBrush does have competitors, but nobody that provides the kind of data and scheduling that the LifeBrush eventually will. A year from now, Hawkins said he hopes to be finishing up the process of integrating scheduling into the app and working with local dentists and corporate wellness programs to test the LifeBrush.